I made the trip from Indian Wells to Carson yesterday, and spent the day at the newly renamed Dignity Health Sports Park, the longtime venue for the ITF Grade 1 International Spring Championships watching first round matches in the 16s and 18s singles. 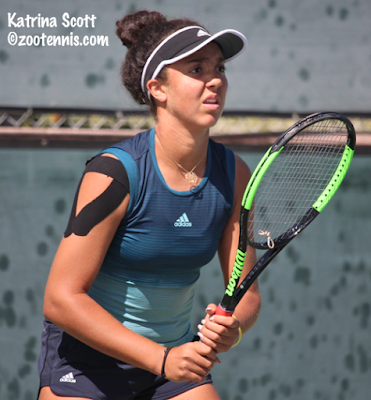 But before I review the results from today, here's the link for my recap of last week's 12s and 14s Adidas Easter Bowl Championships for the Tennis Recruiting Network. A recap of the 16s will follow Tuesday, and the ITF recap will come out on Wednesday. The weather was beautiful in Indian Wells all last week, devoid of the usual winds and searing desert heat that usually are a part of the tournament, and the great weather continued to hold here in Carson, with temperatures near 80 and just a light afternoon breeze. The day began with 16s singles, although the top seeds, including No. 1s Andy Hernandez and Ava Krug, received byes and will begin their event on Tuesday. Forty of the 64 ITF 18s matches were played today, and seven of the 10 girls seeds and 8 of the 10 boys seeds in action today advanced to the second round. Top boys seeds Liam Draxl of Canada and Eliot Spizzirri earned wins today, with Draxl defeating 2018 16s finalist Max McKennon 6-3, 6-4 and Spizzirri beating wild card Micah Braswell, the recent Irvine Grade 4 champion, 7-6(4), 7-5. No. 6 seed Dali Blanch lost to qualifier Welsh Hotard 6-3, 6-4 and No. 10 seed Adam Neff was beaten by Spencer Whitaker 1-6, 6-2, 6-4. Hotard has now won four matches in three days here, but will have the day off from singles Tuesday, with just a doubles match in the afternoon. The top two girls seeds, defending champion Hurricane Tyra Black and Savannah Broadus, play their first round matches on Tuesday, but No. 3 seed Abigail Forbes has already exited the singles draw, with Katrina Scott beating the UCLA recruit 6-4, 7-5. The 14-year-old Scott led 5-1 in the opening set, and trailed 4-1 in the second set, but managed to hang on in the first and come back in the second to post the victory. "She's one of my close friends, we train together and she knows my game like the back of her hand and I know her game like the back of my hand," Scott said. Scott pointed to her consistency and her determination as keys to taking in the first set. Even as Forbes began to chip away at the lead, Scott avoided panicking. "I was up 5-1 in the first set, and then it was 5-1, 30-40," Scott said. "We had a super long point, but I'm glad I got through it." In the second set, Scott was able to use that same mental strength to keep the pressure on, but Forbes did have an opportunity to serve out the set at 5-3, only to get broken at love. "I knew she was gaining momentum, so I was doing everything that I could to just stay in the second set, and stay with her," Scott said. "I got a couple of free points and got the momentum again and everything flowed from there." Scott was aware that Forbes had won two Grade 1 titles this winter, but didn't let that change her approach to the match. "I knew who was across the net, but I wasn't paying attention to it," Scott said. "I had to respect what she's done, but I also had to focus on my own game. So I just kind of put it away and look at it like another regular match, not like playing a top player, which she is. I wanted to do well and knew I could do well and that's what got me through today." Joining Forbes on the sidelines were No. 5 seed Kylie Collins, who lost to Zoe Howard 6-4, 6-3 and No. 9 seed Alexandra Vagramov of Canada, who lost to Elvina Kalieva 6-4, 6-4. Although the ITF now prohibits live scoring at junior events, the USTA did obtain a waiver from that for this event, and live scoring is available via Tennis Ticker here. Tuesday's order of play is at the tournament website. The ITF results are available on the ITF Junior Circuit site.